A novel fiducial points on curves and surfaces that are preserved under affine and weak perspective transformations, are local, intrinsic and computed from the differential geometry of the curve/surface is introduced in this research. These are used in a non-iterative geometric-based method for shape matching and 2D and 3D object registration in the presence of affine or nonlinear transformations that can be approximated by piece wise affine transformations. To reduce the sensitivity of the computation of the fiducial points to noise, we use a B-Spline curve/surface representation that smooths out the curve/surface prior to the computation of these invariant points. The matching is achieved by establishing correspondences between fiducial points after a sorting based on derived set absolute local affine invariants. The performance of the matching based on these fiducial points is shown for a variety of object matching problems, and is shown to be robust and promising even in the presence of noise. An application on fingerprint alignment, 3D face alignment and palmprint alignment are demonstrated. Chuchart Pintavirooj received the B.Sc. and M.Sc. from Mahidol University, Bangkok, Thailand in 1985 and 1989, respectively. In 1995, he received another master degree in biomedical engineering from Worcester Polytechnic Institute, MA, USA. In 2000, he earned a Ph.D. in biomedical Engineeringfrom Drexel University, Philadelphia, USA. He joined Department of Electronics, Faculty of Engineering, King Mongkut’s Institute of Technology Ladkrabang, Bangkok, Thailand where he is currently an associate professor. 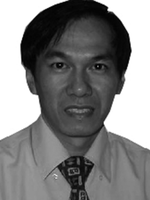 Dr. Pintavirooj’s research interests include image reconstruction, image classification, and image restoration. He wrote a number of books in digital Signal Processing, Digital Image Process and Biomedical Engineering. (www.bmekmitl.org). He chaired a conference in Biomedical Engineering including BMEiCON 2012-2013. Currently, he is the secretary of Biomedical Engineering Societies of Thailand.